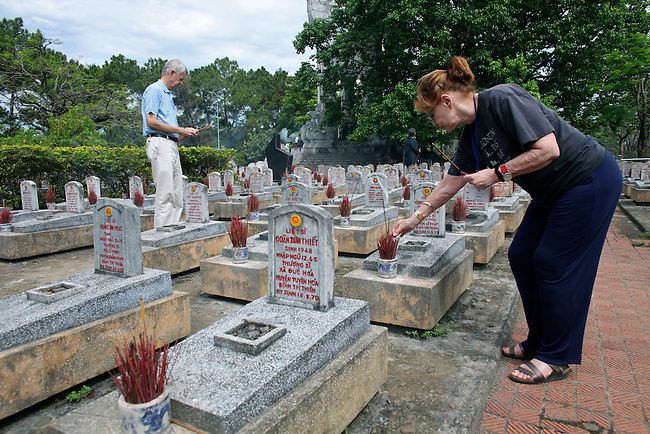 Chuck Searcy and Myra MacPherson, of Veterans for Peace, place burning incense sticks on the graves of Vietnamese solders at Truong Son Martyrs Cemetery in Quang Tri province, Vietnam. The cemetery contains the graves of about 10,300 communist soldiers who died along the Ho Chi Minh Trail supply network into South Vietnam during the conflict from 1959 to 1975. April 24, 2013.